You can easily add external designed email template to your template gallery inside your EasySendy Drip (or EasySendy Pro) dashboard. To upload the email template, click “My Templates” under “Templates” menu of EasySendy Drip (or EasySendy Pro) dashboard. On next screen, select “Upload Template” button which appear at right side of screen. A pop-up will appear. From the pop-up, select the .zip file to upload. Next option is, if you have used Inline CSS, then, select “Yes”. Also, if you need to minify the email template, then, you can select this option. 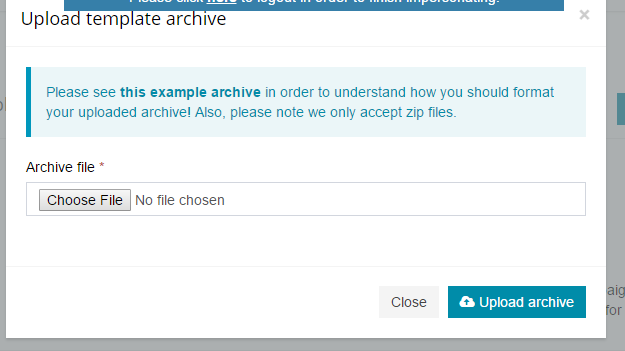 Finally, click “Upload Archive” button to upload the email template. Note: Please see this example archive in order to understand how you should format your uploaded archive! Also, please note EasySendy Drip (or EasySendy Pro) only accept zip files. Once, you have imported these template, you can save them in your template gallery and later on, you can use these template accordingly inside the email campaign as required. PS: Donot forget to modify the unsubscribe and company address tags accordingly.